If you read my blog last week, you heard that life has been a little crazy-town lately. The good news is that things have settled down a hair, and the family and I are starting to get back to our regular routines. 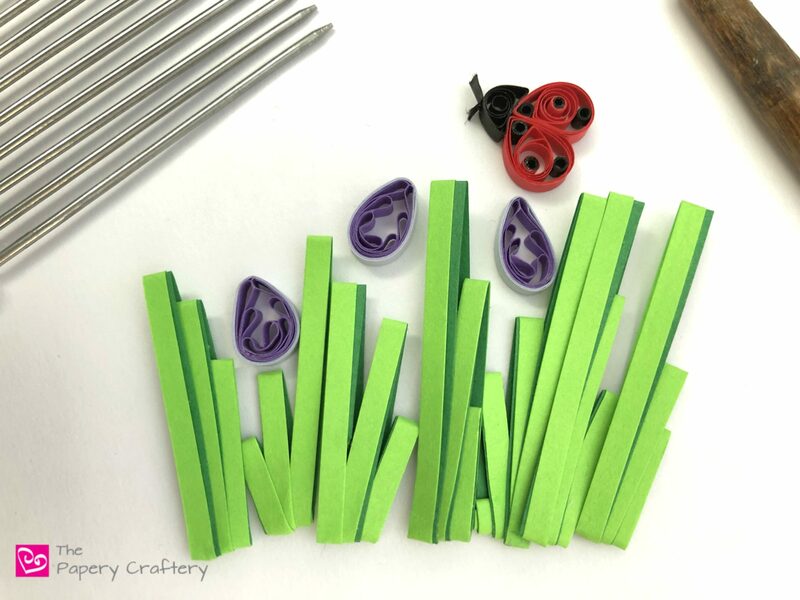 I still have a little catching up to do, but I couldn’t let another week go by without a new quilling tutorial, no matter how small it is. 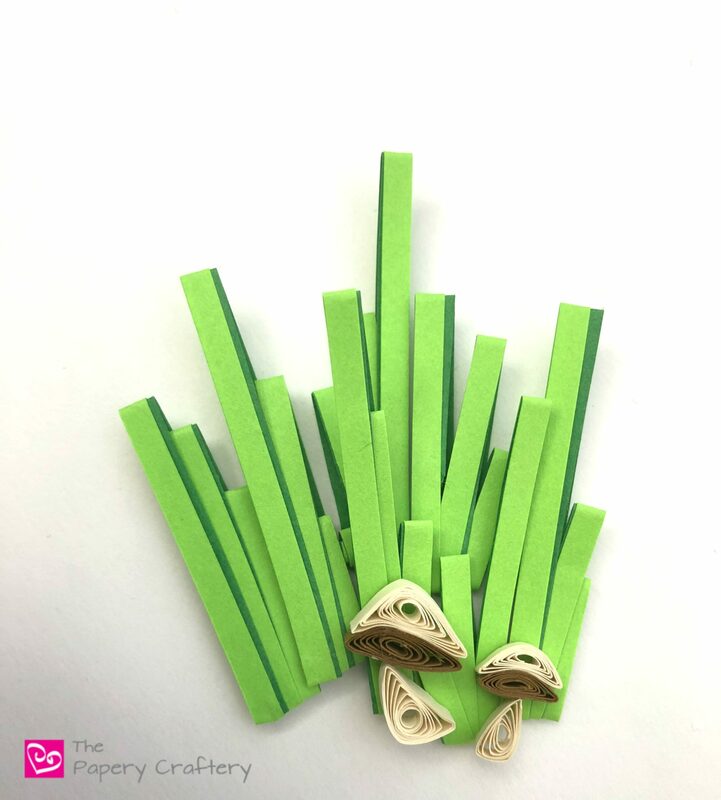 I’m sharing my tutorial for a fun way to make two-toned simple quilling paper grass. 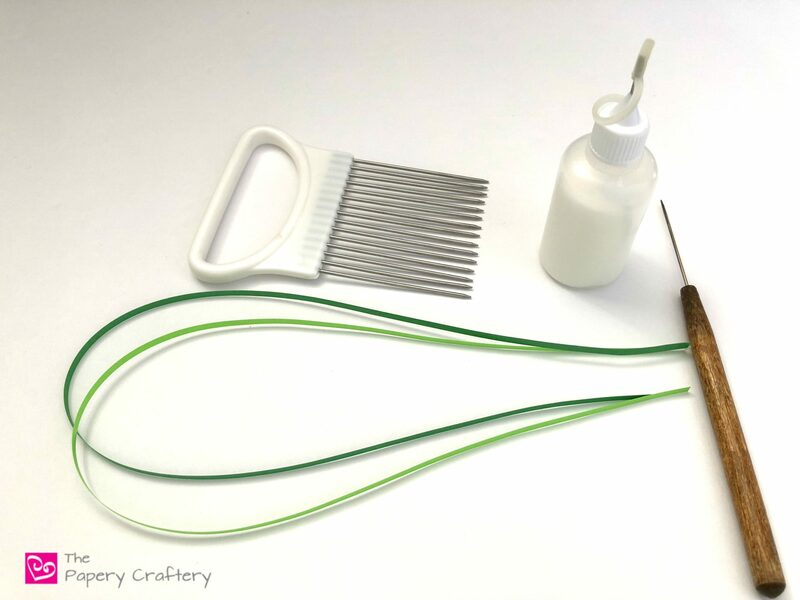 I thought I would share this quick tutorial now because everyone might still have their quilling combs handy after trying out the lily pads from a few weeks back. 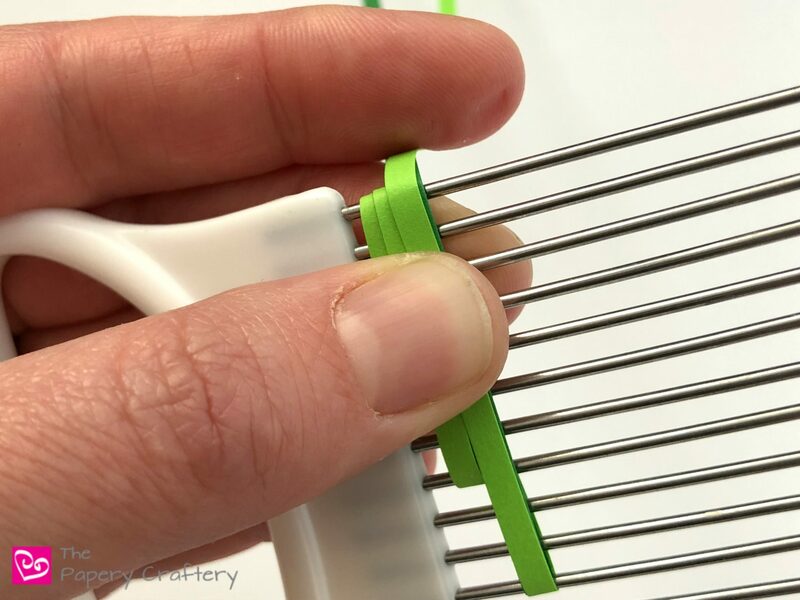 Besides a quilling comb, there are only a couple other tools necessary. 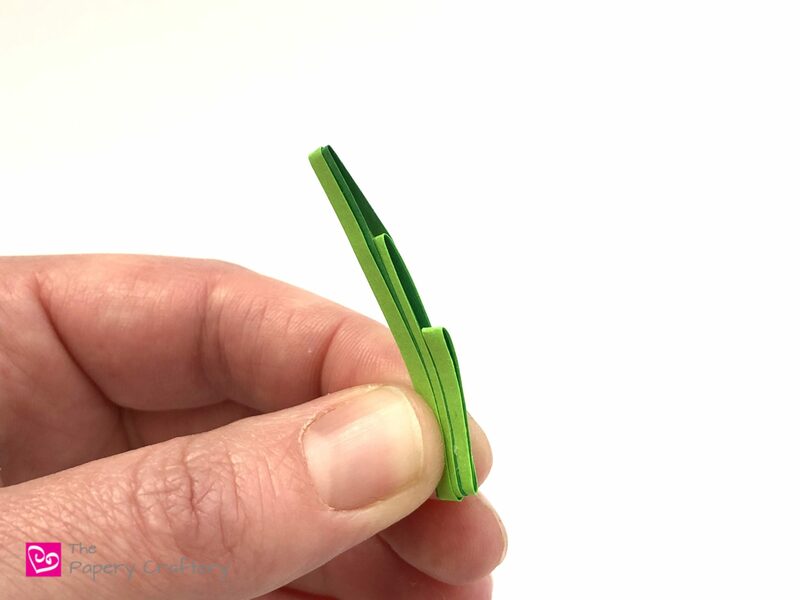 All you’ll need are a needle tool, some glue, and two different shades of green paper. I’m using Quilled Creations’ Lime and Leaf green. 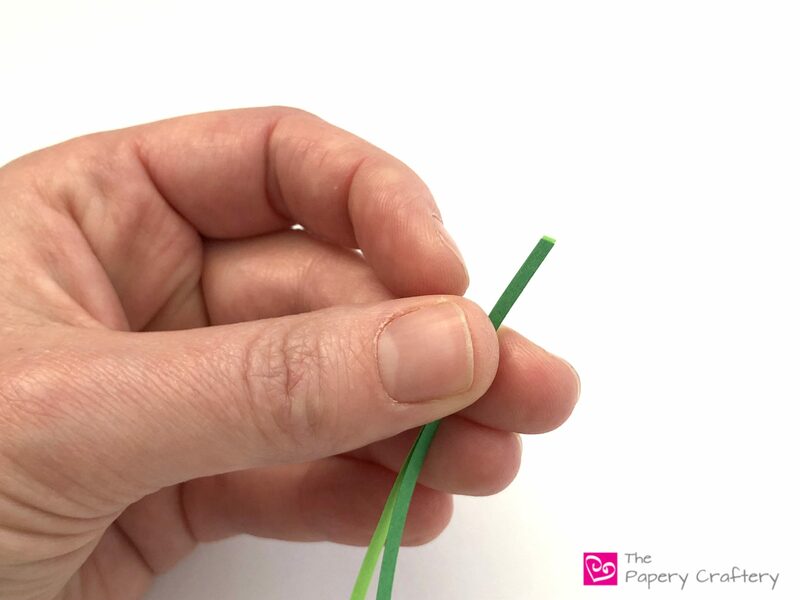 First, in order to achieve the two-toned effect on your grass, line the strips up at the end. From this point forward, you’re going to be working with the strips together, at the same time. 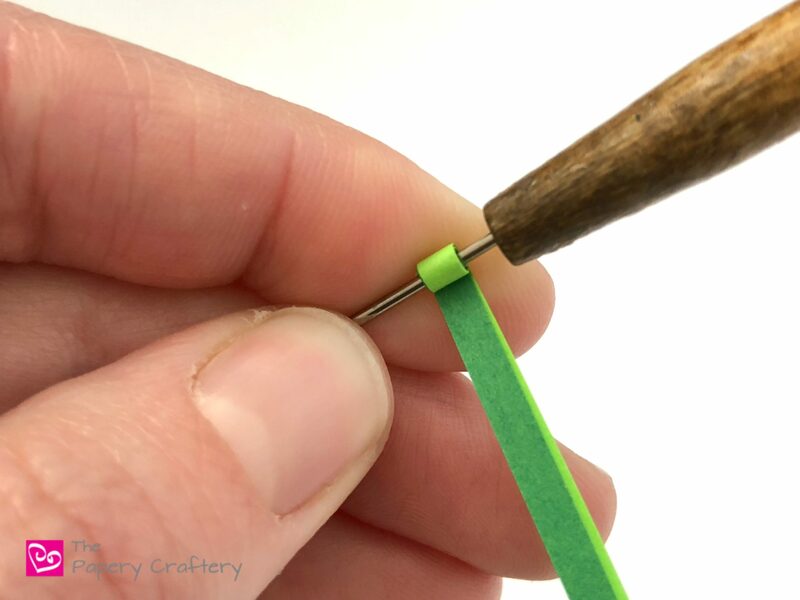 Roll slightly with your needle tool to make a small loop. 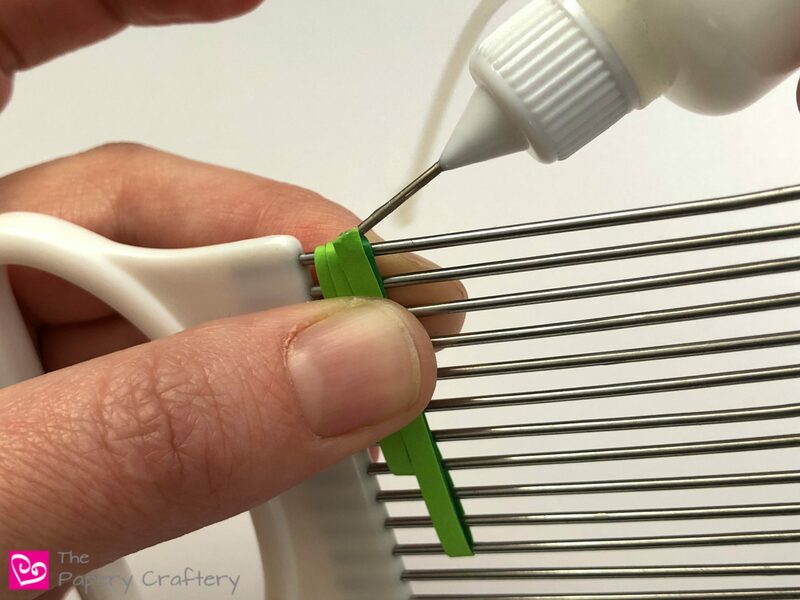 This will give your strips a bit of an anchor on your quilling comb, which is especially useful when using more than one color. Keep in mind which color you’d like as the main color of your grass. Because I wanted my grass to be lighter in color, I chose to use the Lime paper on the outside as I rolled. 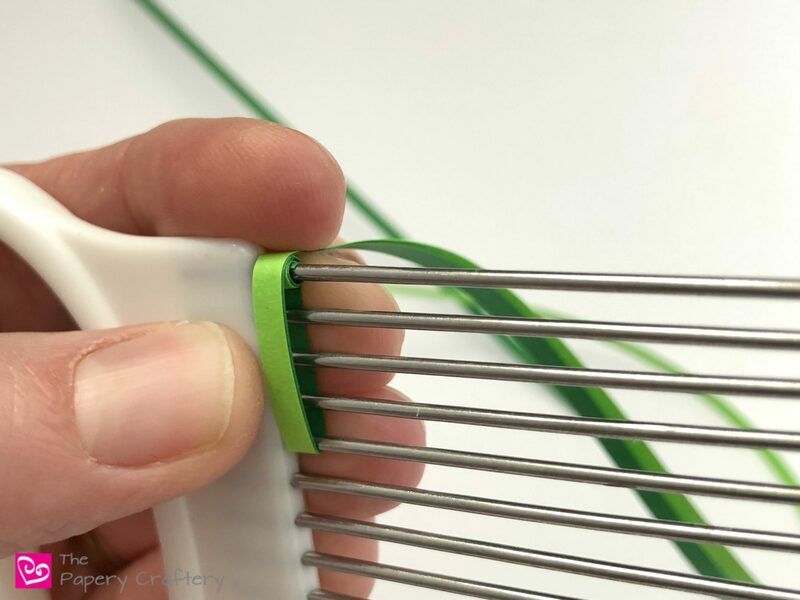 Remove your paper from your needle tool and place the loop on the first space on your quilling comb, with the rest of the strips towards the back. Pull the strips back to the front a few teeth down on the comb. The exact number doesn’t matter, but this will be the shortest blade of grass of the three that we’ll be making here. 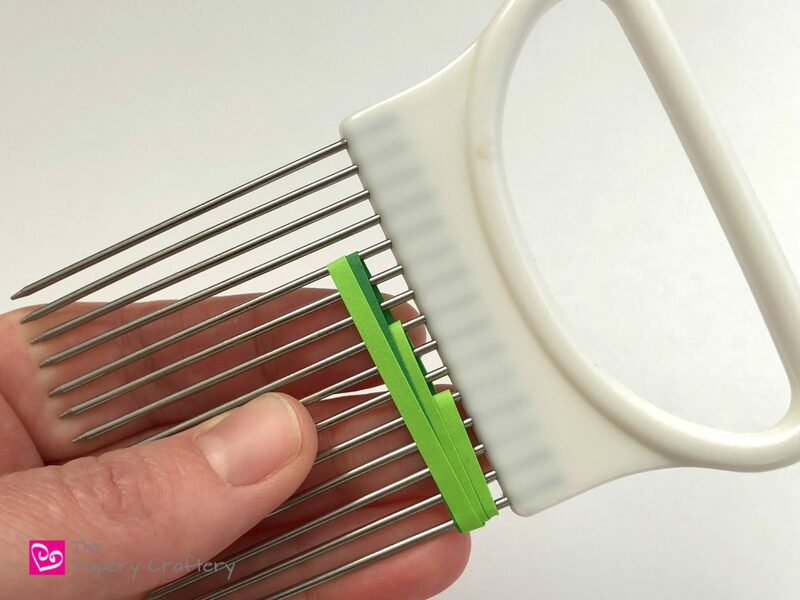 Pull the strips back to the top of the comb and towards the back. Skip a few more teeth and pull the strips back towards the front again. Take care not to overlap the first loop completely. The idea is to pull the second loop to the side slightly. 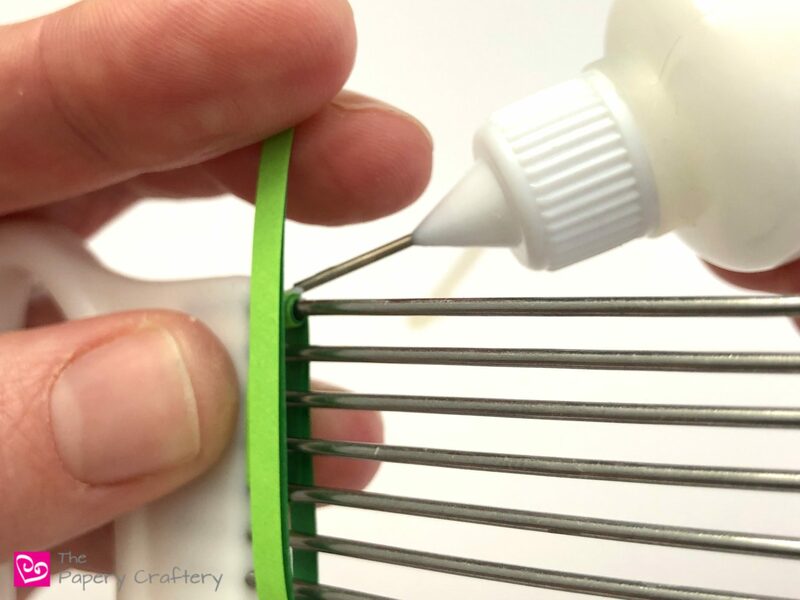 Add a small dot of glue where the two loops meet to secure. Angle the rest of the paper a little to make the third and final loop. Pull the strips back to the front a few spaces down. Bring the tail back to the top, overlapping the previous loop a bit. Tear off any excess paper. Add a little more glue to keep the ends in place. 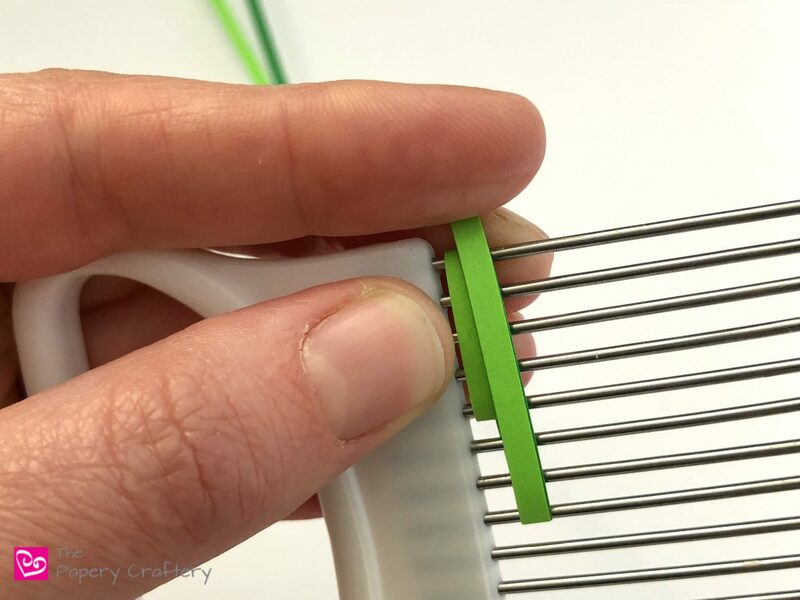 When you flip over your comb, you’ll see the three loops have made three blades of grass with the darker color peeking out. I think it gives the grass a realistic shadow effect. 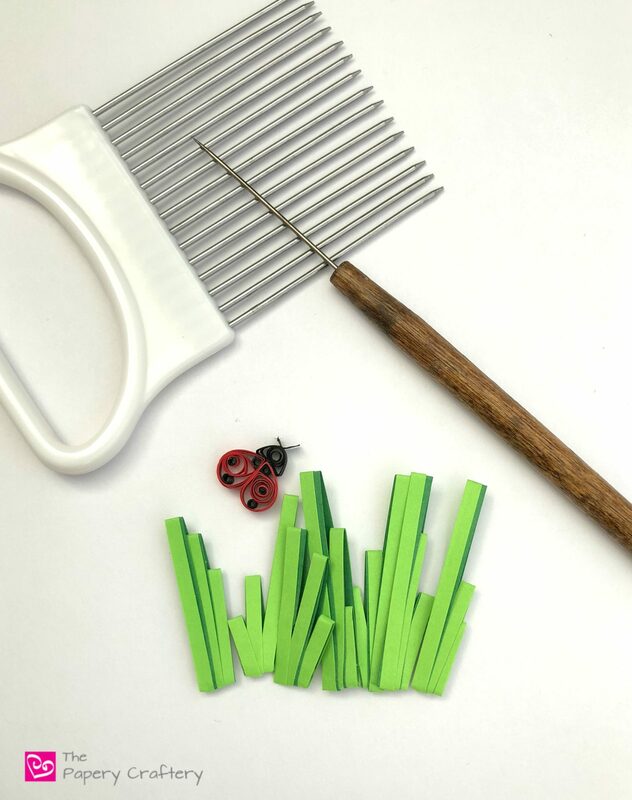 After you take your simple quilling paper grass off your quilling comb, give it a good couple pinches all over. 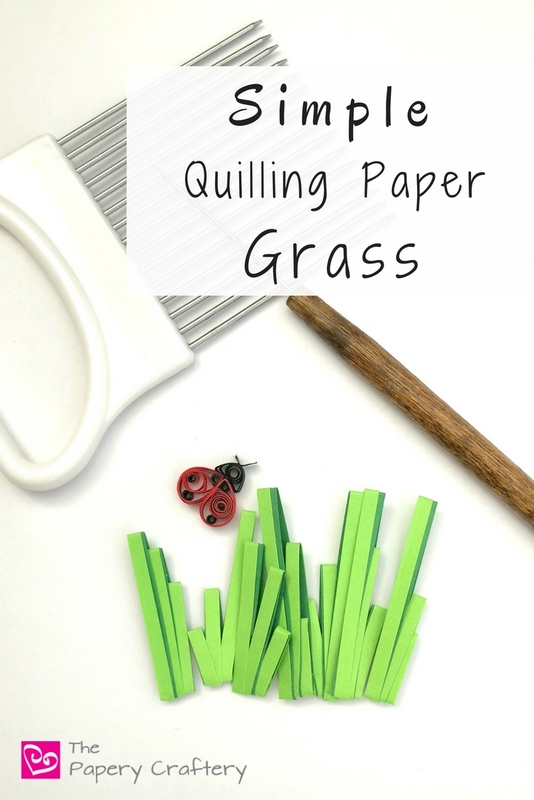 This will close all the loops and flatten your strips to be more grass-like. I also like to bend the blades too, since most grass has some movement to it. Once you get the hang of it, you’ll be making an entire lawn in no time! 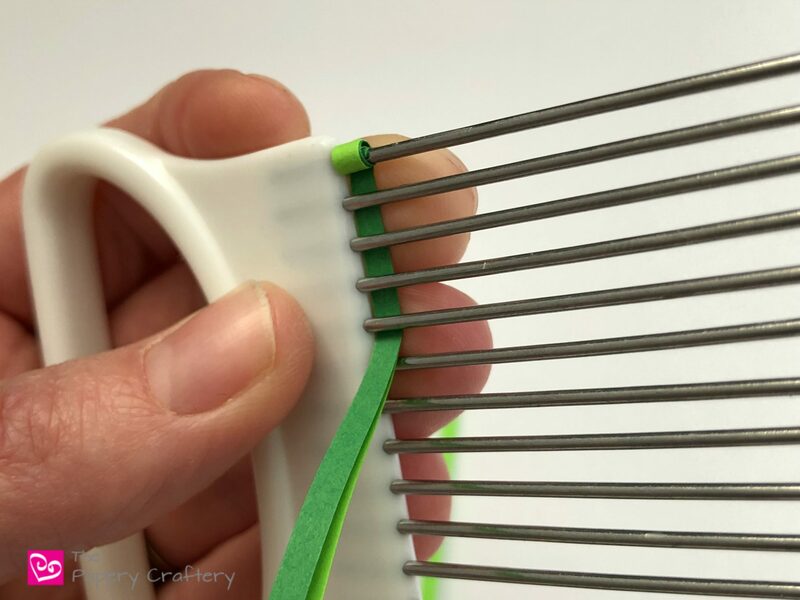 Try varying the number of teeth between the loops you make on your comb, so your grass isn’t all exactly the same. Be sure to layer the grass slightly, as well. … maybe a sweet little ladybug! Add a few flower buds and you’ve got yourself a whole scene! 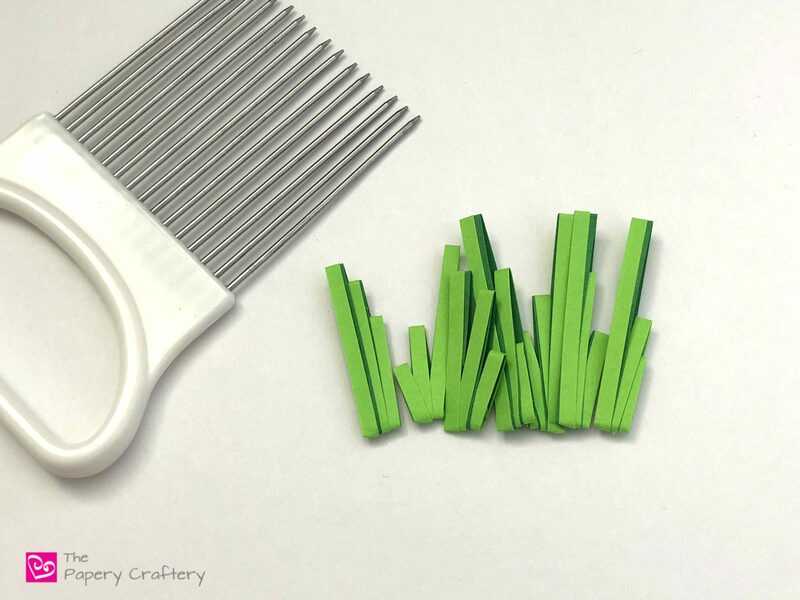 I love this simple quilling paper grass for an easy summer scene. And the two shades of green truly set it off nicely. 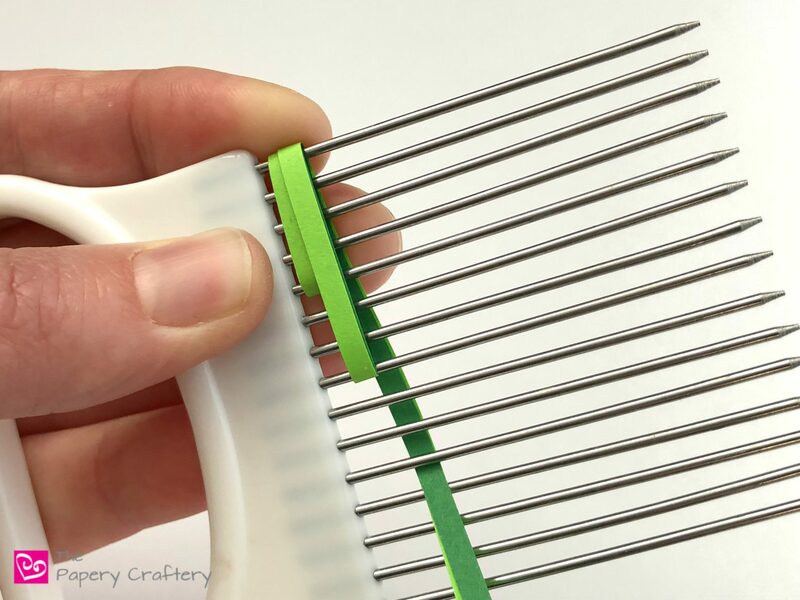 Plus, I really enjoy putting my quilling comb to work! I’m hoping to share some more tutorials soon as I keep playing around with my comb. In the meantime, enjoy practicing this project and happy crafting! Just loved this tutorial – simple but very effective. And it provides the last ingredient in a piece I’ve been planning for a while. Thank you for the inspiration! I’m so glad I could help, Janet! So cute! I love this idea! Thanks for sharing!